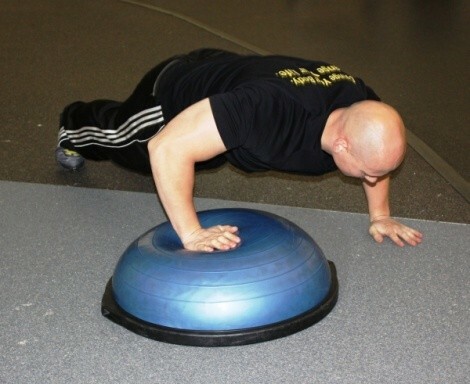 Personal trainer Nick Remy does pushups with one hand on a bosu ball for increased conditioning. It’s a hard time for recreational athletes and others who enjoy outside action. It’s cold, and skies darken earlier. Most races and other events are finished. Worse, the lifts haven’t started running yet, so you can’t even go skiing or snowboarding. But now, before resorts open for winter, is a perfect time to build skills that will make you a better athlete in every one of your activities. Don’t let cold weather turn you into a slug. Get thee to the gym! Personal trainer Nick Remy says, “There are lots of things you can do in a gym for specific sports training. You can use medicine balls (heavy balls), the Bosu ball, all kinds of equipment that give you more functional training that builds balance and coordination.” When it comes to sports, whether it’s climbing, skateboarding or tricking it in the terrain park, he (or she) with the best balance, coordination and strongest core will survive. Next, turn the ball over for more advanced core and balance work. Stand on the flat side and—with less weight than you normally lift—perform exercises like dumbbell curls, shoulder presses and squats. Do the same free-weight exercises you normally do on a flat surface. The Bosu ball demands more work from your core-stability muscles, thus improving your sense of balance. Increase the resistance you use as your balance improves. If the wobbly flat platform of the Bosu is too difficult, work up to it by using two DynaDiscs, a smaller and flatter inflated round cushion that’s easier to balance on than a Bosu. Most gyms have this equipment. If not, ask your gym manager to get it. PERSONAL TRAINER NICK REMY USES DUMBBELLS AND A BOSU BALL FOR A CORE-WORKING BALANCE DRILL. There are some good machines in the gym that recreational athletes ignore, or else don’t use to the fullest potential, such as the smith machine, leg press or weight-assisted pull-up/dip machine. With the smith, you can do heavier squats or change position to give more work to your glutes and hamstrings. THE SMITH MACHINE ALLOWS YOU TO CHOOSE WHICH MUSCLES WORK MOST IN A SQUAT. AN UPRIGHT POSTURE PUTS MORE RESISTANCE ON THE BACK. FEET FORWARD WORKS THE CORE. 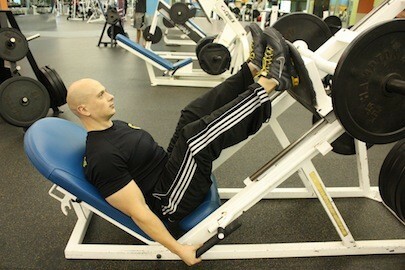 PUT MORE PRESSURE ON THE INSIDE OF ONE FOOT AND OUTSIDE OF THE OTHER, THEN SWITCH TO WORK THE ADDUCTORS AND ABDUCTORS. 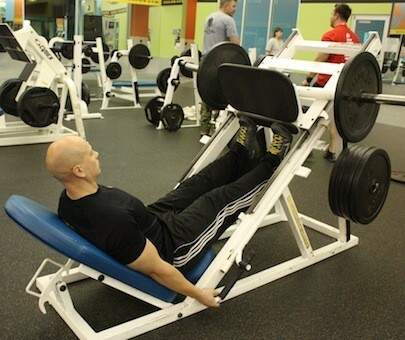 Using different foot positions on the leg press allows you to work different parts of your lower body. PLACE MID-FOOT AND HEELS HIGH ON THE PLATE TO FOCUS MORE RESISTANCE ON LOWER ABS, GLUTES AND HAMSTRINGS. Weight-assisted pull-ups and dips allow you to work your entire upper body and core with a manageable resistance. You can even change which muscles you train by changing your grip. 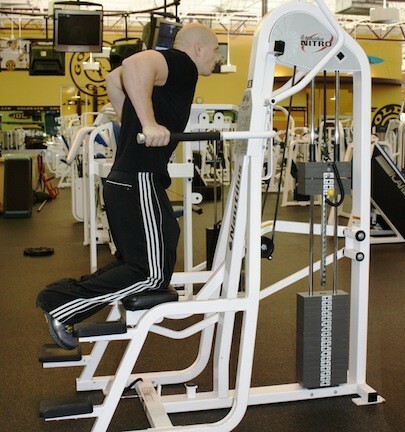 THE WEIGHT-ASSISTED DIP MACHINE BUILDS THE UPPER ARMS (FOCUSING ON THE TRICEPS), PLUS THE CHEST AND SHOULDERS. ADJUST THE RESISTANCE UPWARD EVERY WEEK TO A WEIGHT YOU CAN HANDLE WITH GOOD FORM FOR AT LEAST 12 REPS. 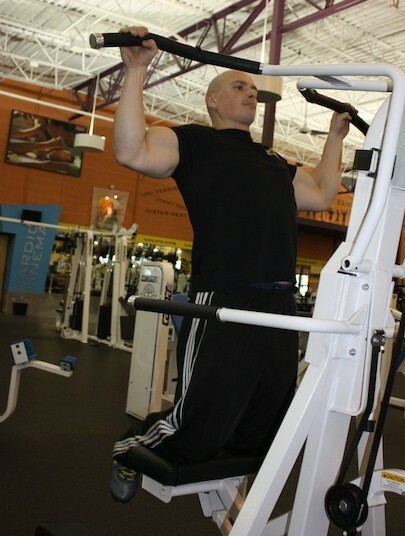 REGULAR USE OF THE MACHINE BUILDS THE ENTIRE UPPER BODY. A wide grip on the pull-up bar will work your upper lats; a narrow grip will put more physical stress on your lower lats, and an underhand grip (palms facing toward you) will work your biceps. THE WEIGHT-ASSISTED PULL-UP/DIP MACHINE ALLOWS YOU TO LIFT AS LITTLE AS 10 POUNDS. REGULAR WORKOUTS ON THIS MACHINE WILL BUILD THE LATS, TRAPS AND BICEPS SO THEY GET STRONG ENOUGH TO LIFT YOUR FULL BODY WEIGHT. His advice is especially important to athletes who don’t want to lose fitness during this transition season. The body quickly adapts to whatever stress it has to deal with—as well as any slug-like lack of stress.